1. For the butter-washed cider cordial, gently melt the butter in a pan over low heat. Stir in the cyder, vinegar and lemon juice, and transfer the mixture to a bowl. 2. Allow to cool, then cover and place in the fridge overnight. 3. Remove and discard the fat that solidifies on the surface. Strain the liquid through a fine mesh sieve and add the caster sugar, stirring well to dissolve. 4. 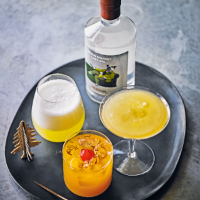 To make the cocktail, stir the reserved butter-washed cider cordial and gin in a shaker over ice for 2 minutes. Strain into a glass and serve. This recipe was first published in Thu Nov 22 10:11:00 GMT 2018.